Free Mobile Phones, Gaming Console, HDTVs, etc. Earlier known poker, I do not know anything about this. Just play as entertainment for leisure. And in fact initially I did not want any further or more often playing poker. After knowing pokerschoolonline and pokerstars I learned how to play good poker and play the way the pros do. I know more people are tied in a single community, which is pokerschoolonline or PSO. This community really makes me more excited to play poker, not because of anything but because of their desire to meet and chat, share and exchange opinions about poker strategy. Introduction to the players is actually very impressive. And the most memorable events and the best is when I'm playing poker and meet with them. Not the result of the game but the result of the process that makes the game more meaningful. You all know and often find some players to play with wild without the concept and strategy, luck or just rely on bingo. And when they lose, that comes out of his mouth were the words racist and immoral even mocked other players. Pokerschoolonline changed this, wild players such diminishing returns and is rarely found, unlike earlier used a lot of players are like this. Pokerschoolonline taught how to play with patience, mutual respect and strong play with patterns and accurate for me.Dare to accept the risk of losing, because this is a game where we sometimes lose, and there are times when we win. Meet the players in the PSO community at the same table is the best moment for me when playing on pokerstars. Those who give meaning or value of its own in the game. And when I play often I imagine meet them and greet "hiccup, how are you? '. I'll say hello to some of them. Outcast13, Cote (where are you now? ), Dreams78 (are you still dreaming? ), 3rd again (when it will be first? ), Dale44, buzzliyear, soulhunterid, triumphs, znri, arisoze, effsea (I will never hear the clue : D) and others. league promoted by PSO is the best league in the pokerstars. I have learned a lot about poker strategy, on game conditions, about reading the situation, and most of the knowledge and experience is of PSO. After learning is directly applicable in the actual competition. Most graduates PSO gain position or rank very well in various competitions. I always hope and pray that they all be in the forefront among others. Finally I can only hope that later I get the most looked forward to the time I managed to win a major tournament with a big prize. Of course, everyone hopes as my expectations, and PSO has equip people to get it, including me. Maybe World Blogger Championship Of Online poker can be the right and best for me to become a true champion. Because WBCOOP provide opportunities and opportunities for anyone to have in addition to cunning and clever play poker too clever use of media as a tool that can help him develop and mature in the game. I have been playing poker about 1 or 2 years ago and a bad thing was i have never win big in all of my poker tourney. I just hope (and hope) for my first big prizes from pokerstars, but never realized. Waiting for the first big prizes that can change my life was never tired me, my dream will come true if i could win the WBCOOP contest. Maybe this is the way that given to me to get big prizes from pokerstars. Many people like me trying hard to win this contest too, then i'll try my best. I must win, and i must win. Wish me luck. 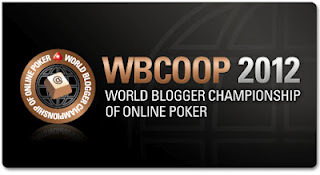 PokerStars' World Blogger Championship of Online Poker (WBCOOP)back for 2012, and the deadline for a qualifying blog submission Tuesday, February 21st. This year’s series runs from February 23-March 4, with more tournaments than ever before across a huge selection of games, ending with the $5,000 Main Event. There are also cash prizes up to $5,000 for the Best Blogger, the Best Live Tweeter, and for players that score big on the WBCOOP Leader Board. All qualifying bloggers will be credited 10 tickets to play in any of the 30 WBCOOP events running until March 3rd, all of which award tickets for PokerStars' Spring Championship of Online Poker (SCOOP) for top finishers. If you cash in any WBCOOP event, you get your seat in the March 4th main event with a $5,000 prizepool. There is a also a WBCOOP leader board prize that will award a package to a live event worth up to $7,000 and a trophy. All it takes to qualify for the $5,000 is either a 500-word blog post or short video, telling them what i would do with $5,000 if i won the WBCOOP Best Blogger prize. I'll very happy If i won the contest. The first important thing was the usefully to help me built my business. I was got in trouble with my home business and have to stop right now, If i won $5000 i'll open it again and growing up. Second i'll buy some gadget like netbook, phone etc. I'll let it in my account for at least $2000, then with this money i'll play some online poker tournaments and try to climb up to be a star in pokerstars.. :) . Just for sharing, Im a man who lifes in a small village in Gunungkidul, Yogyakarta, Indonesia. Actually i love and happy with my village, but now i got frustated with my home business. Hope this prizes can change my life and all of my family lifes come to happiness. Make easy money by completing freelance jobs offer that matching your skill. The world's largest outsourcing and crowdsourcing marketplace for small business. Have hundreds of thousands of satisfied customers from all over the world. Connect over 2,449,683 employers and freelancers globally from over 234 countries & regions. Through the website, employers can hire freelancers to do work in areas such as software, writing, data entry and design right through to engineering and the sciences, sales and marketing, and accounting & legal services. The average job is under US$200, making outsourcing for the first time extremely cost effective for small businesses. Would you like to find freelance jobs and make money online? Just sign up to get started! Have created a safe environment for both freelancers and employers via secure milestone payment system. Have thousands of freelance coders, writers, programmers, designers, marketers and more. Getting the best web design, professional programming, custom writing or affordable marketing has never been easier! Try outsourcing for free today! click the banner below. Elance, the world's leading platform for online employment, helps businesses hire and manage in the cloud. For businesses looking to staff-up a team on an hourly or project basis, Elance offers instant access to qualified professionals who work online. For skilled professionals who want to work online, Elance offers access to qualified clients, a virtual workplace and guaranteed payment for great work. Contractors have already earned more than $351 million on the Elance platform. Elance is located in Mountain View, California. Trusted since 1999. If you are looking to jump-start a project, broaden your reach or just simply get things done, you will find that Elance is faster and more cost-effective than job boards, staffing firms and traditional outsourcing. You name it and Elancers will deliver results, often with a flourish: from writing code, crafting a marketing plan, designing your website, managing your day-to-day schedule and a thousand other projects. If you have skills and talent and are seeking independent work online, Elance offers access to qualified clients, a virtual workplace and guaranteed pay for great work. To help make delivering great results easier for you, Elance offers a suite of tools to help make your work life as efficient as possible. want you to follow your passion. Whether you are a business or an independent professional providing services, Elance strives to give you all the tools you need to hire great talent and take on interesting work. DoNanza lets you easily find the best work-from-home projects and contests from all over the web, matching your skills and interests, Simply enter your skills or interests into the DoNanza search engine, sit back and start getting great work-from-home opportunities from thousands of sites that best match your skills and budget expectations. One search, that's all. Bonanza want to give you the best possible tools to leverage your skills and interests to make more money working from home. The Bonanza project database contains hundreds of thousands of work-from-home projects and its constantly updated with new projects that are found across the internet - they are all waiting for you! Once Bonanza collect all those work-from-home projects, next mission (yes, we choose to accept it) is to expose them all and help YOU find the most relevant projects by showing you all the data you need in order to make a fast decision about doing a project. Bonanza also work hard to give you real-time data regarding to the current status of each project (how many bids, avg bids, time left, etc). Want to give every piece of information available to make sure not only enjoy projects, but that they pay well enough to fund your next (much deserved) vacation. DoNanza is actually perfect for everybody! Whether you are a professional freelancer, a stay at home parent, a student, hobbyist, or just someone who has talents and skills that you want to use to make more money while working from home. (Don't we all?). Every person can find work-from-home projects relevant to his skills and interests, and DoNanza is here to help. Whether you came here to make your living, make a fortune, or just to challenge yourself in your free hours doing the things you love, you came to the right place. Outsource website programming, design, writing and marketing projects to freelancers on ScriptLance. Scriptlance connecting businesses with programmers. PeoplePerHour is a marketplace connecting small businesses and freelancers all over the world in a trusted environment where they buy and sell services to each other. Since launching in 2008, 38337 small and medium sized businesses across the world have used PPH site to outsource over $36,100,000 worth of services, from small one-off projects worth less than $150 to on-going contract work. Businesses use PPH site to remain flexible and efficient, scaling their business up or down as and when they need to without the overhead and cost of traditional Employment. Service providers (‘Freelancers’) on PeoplePerhour (PPH) come in many varieties and skills, from self-employed professionals, incorporated businesses or simply people who work around their Job to supplement their income and explore other talents they are passionate about. Creating a profile is FREE. PPH charge a small service fee on success based on which usage plane you are on as outlined below. Over 38,337 business clients now use PeoplePerHour.com to outsource work regularly giving PPH community of 109,242 talented freelancers immense reach for little or no cost. 99designs is the #1 marketplace for crowdsourced graphic design. 99designs connect 98,872 passionate designers from around the globe with small businesses who need design projects completed. And, 99designs do it in a timely fashion without the usual risk or cost associated with professional design. 99designs was started by designers for designers. Role at 99designs is to provide a friendly, professional, and secure environment where designers from all walks of life can compete on a level playing field—where they can show off their work, improve their skills, communicate with peers, and win new clients. In 2010, 99designs was awarded a prestigious Webby People's Voice Award for Best Web Service & Application of the year. How did 99designs do it? By promising 99designs entire community that if they voted for 99designs and 99designs won, 99designs would sing "We are the Champions" by Queen in a main street. Well - showing true community spirit, 99designs voters flooded the system, 99designs won and 99designs sang. Here's more free url shortener.. I have made ​​an excellent toolbar. I created the toolbar for free via facilities provided by Alexa. Through this toolbar I can share a lot of content that I have made on blogs, facebook and twitter. This toolbar is very useful for. Message your users with dynamic content from your blog or website. Put your logo and links to the most important content on your site in the browser. Make it easy for users to interact with your company via Facebook and Twitter. * And, drive more traffic to your website! Add links, menus, site search and dynamic headlines that send traffic back to your site. Studying this topic does not seem to be inexhaustible. Lots of webmaster tools that can be used to improve the ranking of a web blog in the list of search engines. below are some services that can be used free of charge to analyze and maximize our web / blog. Page Rank checker : Prcheckingtool, Mypagerank, Prchecker, Checkpagerank etc. Some tools are just a fraction of the many free tools available. For beginners I think the use of tools above to be sufficient to boost the ranking of a web blog in the list of search engines. Uses a unique Credit system to reward customers with Free Mobile Phones, Gaming Consoles, MP3 Players, HDTVs and Macs/PCs! Each Gadget is received for Free in exchange for Credits which can be received. When you register and select your Free Gift, you will receive a 'Referral ID' which is used to gain Credits. Credits can easily be gained by either (or a combination of) participating in Offers, Referring Friends, or by purchasing a Clix Package. Founded in 1998, ClickBank is a secure online retail outlet for more than 50,000 digital products and 100,000 active affiliate marketers. ClickBank makes a sale somewhere in the world every three seconds, safely processing more than 35,000 digital transactions a day. Serve more than 200 countries, and are consistently ranked as one of the most highly-trafficked sites on the web. Anda ingin mencari job online. Di sini banyak ssekali penawaran yang diberikan kepada anda untuk mengerjakan suatu proyek dari seseorang atau perusahaan. Budget terhadap pengerjaan tersebut biasanya ditentukan pihak pemesan, dan kita melakukan penawaran untuk menyelesaikan proyek tersebut. Berbagai bidang garapan/pekerjaan yang sesuai dengan keahlian kita ditawarkan di sini.. Mau coba.. silakan masuk ke FreeJobOnl.